I have recently finished reading this book for around 5th time. Reversing heart disease is one such book. Internet is filled with nearly all the information you need. This works well, if you are dealing with a specific question or query. But, when it involves something related to your belief or understanding about ‘anything’, you need an in depth conversation. Belief is more or less backed by your reasoning and experiences. That is the only way a thought upgrades to belief. Which means to change a belief, the reasoning needs to be satisfied or experience needs to change. Which brings me back to this book. Even with our medical advancements, the instances of heart problems are only rising. We have access to better lifestyle, better food & more information about how to stay healthy. Still, there is high chance that you know someone in your immediate circle with heart related issues. High blood pressure, low blood pressure, blockages, and what not. Even in people below age of 35-40 working in regular corporate environment. And these instances are not slowing down. How yoga takes care of stress. Dr. Dean Ornish is the first clinician to offer documented proof that heart disease can be halted, or even reversed, simply by changing your lifestyle. Based on his internationally acclaimed scientific study, which has now been ongoing for years, Dr. Ornish’s program has yielded amazing results. Participants reduced or discontinued medications; they learned how to lower high blood pressure; their chest pain diminished or disappeared; they felt more energetic, happy, and calm; they lost weight while eating more; and blockages in coronary arteries were actually reduced. 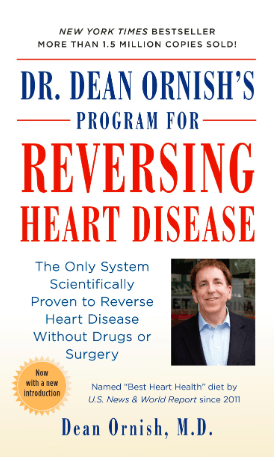 In his breakthrough book, Dr. Ornish presents this and other dramatic evidence and guides you, step-by-step, through the extraordinary Opening Your Heart program, which is winning landmark approval from America’s health insurers. The program takes you beyond the purely physical side of health care to include the psychological, emotional and spiritual aspects so vital to healing. This book represents the best modern medicine has to offer. It can inspire you to open your heart to a longer, better, happier life. My purpose of recommending this is book is not the ‘Opening your Heart program’ (which is quite effective) but to help you in changing your belief and understanding about heart problems. This book presents you documented study about heart diseases. Conducted by a trained Doctor. Someone from medical fraternity to be able to show you so, takes careful observations & detailed data sets. Which this book has done beautifully. Heart diseases especially coronary blockages are one of top reasons for heart diseases around the world. With changing lifestyle, constant stress & sedentary jobs, more & more young people are facing issues of coronary heart diseases. The dampener is that these issues leads you to medication & restrictive routine. Even if you are not facing medication, the very word of heart disease leads to stress, thus escalating the initial trigger itself. Now, the reason of this post and this post is not to stop you from taking medicines all of sudden. This book is to make you understand the issues in better way and then take steps to cure the cause & the symptom once and for all. Our heart is the engine that pumps the blood through our body and our lungs. Any disturbance or slowing down leads to inefficient blood supply. And without proper blood circulation of oxygenated blood, nourishment of body is hampered. It is not at serious or scary as it is sounding right now, but it is not something to be taken lightly too. Why lifestyle changes are required? Let me tell you it this way, when you take medication for any heart disease, it is to either treat the symptom like blocked arteries and/or to stop it from progressing further. Medicines are designed to treat problems as they are diagnosed. A medication is not designed for treating the root cause. In case of heart diseases, the cholesterol which is blocking the artery didn’t appear there overnight. It got there as response to something in your lifestyle mainly. Which means, when medication is started it will work on cleaning the arteries, but what it will not work on is the ongoing deposition which caused the issue in first place. That is why, in a way, doctor anyway recommend few things not to do along with taking medicines. The issue is that it doesn’t cure the root cause. For treating the cause itself, you need to take few more steps. Couple of changes which lead to change in the cycle itself. I often hear people say, “Oh, it’s all in my genes. There’s not much I can do about it.” Fortunately, we now know that there is. In our research, my colleagues and I found that changing your lifestyle actually changes your genes, turning on (upregulating) genes that keep you healthy, while turning off ( downregulating) genes that promote health disease ( and other chronic disease). More than 500 can be affected in only three months. Knowing that changing our lifestyle can change our genes is often very motivating and empowering. How to sit cross-legged when you are not flexible?